As a pet parent, you want the very best for your dog. You hope that he will be able to enjoy years of play and love; but when you learn that he is struggling with joint issues that make slow him down and make moving extremely painful, your hear breaks in two. Some dog breeds are predisposed to joint issues, such as hip and elbow dysplasia, such as German Shepherds, Mastiffs, Golden Retrievers, Dachshunds, Great Danes, and Saint Bernards; however, any breed – mixed, large, or small – can develop problems with their joints. Fortunately, there is a way that you can help to strengthen those joints and ease the pain. How? – By offering him joint supplements for dogs. There are a lot of dog vitamins for joints on the market, which can make it hard to choose the best option. That’s why we’ve enlisted the help of experts in animal care, including leading veterinarians, to help us select the best joint supplements for dogs. With the input of our panel, we’ve selected what we believe to be the five best dog joint supplements currently on the market. Now, let’s take a look at each of our top picks for the best dog vitamins for joints. Below, we offer a more in-depth look at each option, including a detailed description, what we like best about each product, and what other users have to say. Once you have read through the reviews and selected the dog joint pills that you think will work best for your furry best friend, click on the buttons under each product to find the best prices currently listed on Chewy and Amazon. 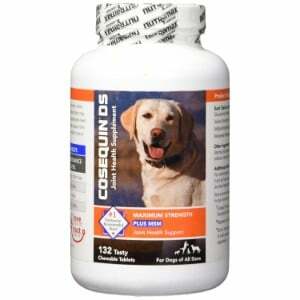 First up on our list of the best joint supplements for dogs is Nutramax’s Cosequin DS Plus with MSM, Chewable Tablets. This joint supplement for dogs has long been one of the most trusted options out there, and it continues to be. That’s because it offers an outstanding blend of three incredibly powerful ingredients that are famed for their ability to significantly strengthen the joints, alleviate inflammation and pain, and even facilitate the regeneration and remodeling of the cartilage that lies between the joints. The active ingredients in this joint supplement for dogs include glucosamine, chondroitin, and methylsulfonylmenthane (MSM). Each tablet contains 600 mg of shellfish-derived glucosamine, 300 mg of pork cartilage-derived chondroitin, 250 mg of MSM, and 3 mg of manganese. Together, these ingredients offer powerful protection and healing power for your best friend’s joints. In fact, vets often recommend Nutramax Cosequin DS Plus with MSM for their dog patients as both a preventative measure, and a way to alleviate issues that already exist. They have been proven to maintain joint function and improve mobility in the joints, as well as alleviate pain. Since they’re chewable, this supplement for dogs is easy to take, and the flavor is supposed to be palatable, too. Final Verdict: If you are looking for an effective way to either prevent or treat joint problems in your dog, than Nutramax Cosequin DS Plus with MSM Chewable Tablets should offer outstanding results. Our panel says that they trust this product implicitly, and most reviewers report a great experience. As for the taste; if your pup does not like it, simply disguise it in his dog food or wrap it up in a tasty dog treat. One of the reasons why veterinarians advice giving dogs hip and joint supplements in a soft chew tablet is because they are easy to administer, and more importantly, they can contain additional ingredients that other dog joint supplements lack. That is certainly the case with Doggie Dailies Glucosamine for Dogs. This dog joint supplement features high quality ingredients, including glucosamine, chondroitin, and MSM; ingredients that most supplements contain. However, this product also contains additional ingredients that are proven to support joint health, such as yucca schidigera, coenzyme q10, hyualuronic acid, omega 3 and 6 fatty acids, salmon oil, vitamin C, vitamin E, and cod liver oil! All of the ingredients are cold-press extrusion, which helps to preserve their integrity and ensures the highest possible potency. This dog joint supplement comes with 225 soft chews, so you’ll have enough for a while. Each of the 225 tables contain 100 mg of glucosamine, 100 mg of MSM, and 50 mg of chondroitin. The remaining ingredients also further support joint health, and offer other health benefits; improved skin and coal health, and heart health, for example. Most dog owners have said that administering this dog supplement for joints is easy, and that their dogs do like the taste. Final Verdict: While the levels of glucosamine and chondroitin may be lower than other dog joint supplements, Doggie Dailies Glucosamine for Dogs is still an outstanding product. It features several additional, natural, high quality ingredients that support proper joint health, as well as skin and heart health. If your pet does not like the flavor, try breaking a tablet up and mixing it in with his dry dog food or wet dog food. 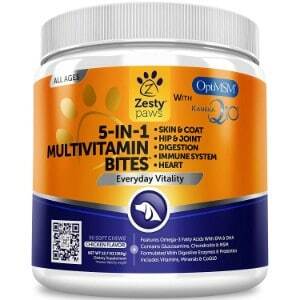 This advanced multivitamin for dogs comes highly recommended by our team of veterinarians, as well as pet owners. It comes complete with 90 chewable tablets, and each tablet is comprised of the highest quality ingredients, including glucosamine, chondroitin, MSM, digestive enzymes, CoQ10, fish oil, niacin, biotin, vitamin E, and so much more! It’s considered a 5-in-1 vitamin, as it not only supports hip and joint health, but it also improves the health of your dog’s skin and coat, his digestive health, his heart health, and the health of his immune system, too. All of the ingredients featured in this dog joint supplement from Zesty Paws are the highest quality and are safe for daily consumption. Just offer your pet one tablet a day and you will see a significant in his joint health, as well as his overall health and well being. Our panel of experts and dog owners alike agree that this joint supplement for dogs is one of the best on the market. It’s safe for dogs of all ages, sizes, and activity levels. Final Verdict: Zesty Paws Advanced Multivitamin for Dogs will do more than just improve the joint health of your furry friend; it will also offer improve his overall health and well being. The ingredients are high quality, it’s safe for dogs of all ages and sizes, and the chewable formula is easy to administer. If your dog does have issues with his stomach while taking this supplement, consider offering him a dog food for sensitive stomachs to see if it helps. Thus far, all of the dog joint health supplements that we have featured on our list are tablets; this option is different in that it is a liquid formula. Simply mix it in with your whatever food your feeding your pup, whether it’s an organic dog food, a low protein dog food, a grain free dog food, or a specialized dog food for large dogs or senior dog food. The formula is palatable and should not only enhance the flavor of your furry friend’s food, but it will improve the nutritional value of his food, too! 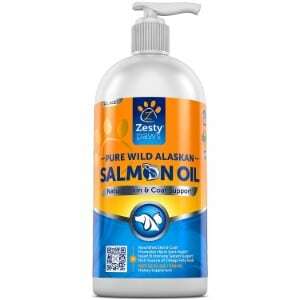 Zesty Paws Pure Wild Alaskan Salmon Oil for Dogs is packed with tons of high quality ingredients. It contains all natural and pure salmon oil, which offers omega 3 and omega 6 fatty acids. These ingredients are designed to improve the joint health of your pup, ease any aches and pains that he might be experiencing, and also improve his heart health, skin health, and the health of his immune system, too! This dog joint health supplement is made in FDA, NSF, and GMP certified facilities in the United States. Final Verdict: Zesty Paws Pure Wild Alaskan Salmon Oil for Dogs is a great option if your dog gives you trouble with taking supplements in a tablet form, even if they are chewable. We love that it can be mixed right into the food without having to break it up. 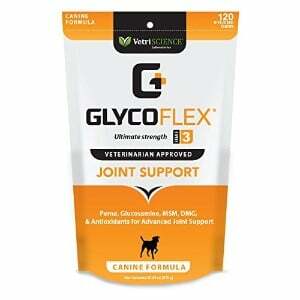 The last, but definitely not the least, joint health supplement for dogs on our list is GlcoFlex 3 Hip and Joint Support for Dogs. It contains the highest quality ingredients, including MSM and glucosamine to support the health of your furry friend’s joints. This formula also features manganese and selenium, perna canaliculus, vitamin E, and vitamin C, which offer additional health benefits for the skin and heart. 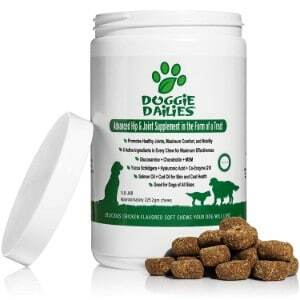 This joint supplement for dogs also features grape seed extract and rosemary extract. Glyoflex 3 is clinically proven to increase the strength of the hind legs of dogs by as much as 41 percent after just four weeks of use. This joint supplement for dogs is recommended for work dog breeds, as well as very active dogs and senior dogs; however, it can safely be used with dogs of all sizes and lifestyles. It can be given as a preventative measures to keep joint issues at bay, or it can be used to alleviate joint issues that have already developed. The chicken liver flavor is highly palatable for dogs. Final Verdict: Our panel of veterinarians and the majority of users were impressed by VetriScience Laboratories GlycoFlex 3 Hip and Joint Support for Dogs. It contains high quality ingredients that are intended to improve the health of the joints in your dog’s back legs in as little as four weeks. The flavor is very palatable, too. As a pet parent, you want to do everything you can to ensure that your dog is well cared for. You go the extra mile to provide him with the very best. You have made sure that he has the most secure dog crate, the most supportive and comfortable dog bed, a spacious dog house or outdoor dog kennel, and even a dog playpen. Of course, you also make sure that he is eating a well balanced diet that suits his nutritional needs and ensure that he is going to the vet for well visits on a regular basis. But there’s another way that you can provide even more care for your pup. How? – By adding the best joint supplement for dogs to his diet. But what is a dog joint supplement, why is it important, and what do the highest quality dog joint health supplements contain? In the buyer’s guide portion of our review, we will offer answers to these questions and more. As you can probably guess by the name, dog joint supplements are intended to improve the health of a canine’s joints. Like humans, dogs can develop problems with their joints, including hip dysplasia, elbow dysplasia, and arthritis. And, just like humans, some breeds are predisposed to these problems; however, all dogs can suffer from joint health issues. If your dog is highly active or overweight, there is even more of a chance that he will develop issues with his joints. Just like humans, issues with the joints can cause a number of problems for dogs. They can cause extreme pain and reduce mobility. In fact, in extreme cases, some dogs can lose all function in their legs. It’s really quite sad. Improved strength. Joint health supplements for dogs can help to strengthen the joints and even regenerate the cartilage. When a dog’s joints are stronger, his overall health and well being will improve. Reduced pain. As your dog’s joints are strengthened, he will experience less pain and suffering. Additionally, the ingredients found in joint supplements for dogs can help to relieve inflammation, which can significantly reduce his pain, as well. Increased mobility. Of course, as your pup’s joints become stronger and his pain is reduced, he will be able to regain his activity levels. Most people report that they notice a significant difference in their dog’s mobility after they start offering supplements. Improved mood. Just like humans, when a dog is in pain, his mood can change drastically. Your once friendly, fun-loving pooch may be irritated, agitated, and even aggressive. By offering your dog supplements for his joints, you will likely notice a marked improvement in his behavior. As his pain eases, he will regain his positive, happy-go-lucky disposition. Better overall health. Many supplements that are intended to improve the health of the joints also contain additional ingredients that improve other aspects of a canine’s health. For example, fatty acids can help to improve his skin health, and vitamins can strengthen his heart and digestive health, too. As you can see, there are a number of benefits that the best joint supplements for dogs can provide. That’s why many pet owners opt to offer these vitamins to their furry friends before an issue with their joints even develops! Not only can they improve existing problems, but they can also prevent them from occurring in the first place; not to mention the fact that they can offer a number of other positive benefits for a dog’s health. The ingredients. The best joint supplements for dogs contain high quality ingredients, including glucosamine, methylsulfonylmethane (MSM), and chondroitin. They can also contain hyaluronic acid, as well as vitamins, CoQ10, and omega 3 and omega 6 fatty acids. Look for a vitamin that is easy to administer. Generally, chewable tablets and liquid supplements are the easiest to offer. The taste. You should also consider the flavor of the supplement; particularly if your dog is finicky. Many supplements have flavors added to improve the taste; however, make sure to watch for artificial flavors that could be harmful to your pet. Joint problems are as much a problem for dogs as they are for humans. As we’ve mentioned, while some breeds are predisposed to these problems, all breeds can develop issues with their joints. To ensure that your pet is as healthy and comfortable as possible, consider adding a joint vitamin for dogs to his diet. The vitamins we have listed in our review are all high quality and are proven to offer great results. However, if you do opt to choose another vitamin, make sure that you keep in mind the features that we mentioned above. In the end, as long as you are offering your pup a supplement that is contains the necessary ingredients, and those ingredients are safe, you should notice a marked difference in his overall health and well being.